An unmanned aircraft in a test in August switched between two spot beams on an Intelsat high-throughout satellite. WASHINGTON — An unmanned military aircraft in mid-August took off from a test facility in North Dakota on a 1,075 nautical mile trip. Its mission was to show whether it could travel seamlessly across spot beams on a satellite without losing contact. Why is this noteworthy? Military surveillance drones typically communicate via satellites that have wide beam coverage so the aircraft always stays in the same footprint. Newer satellites have multiple high-powered spot beams, each covering narrow geographic areas. The challenge for the unmanned airplane was to switch beams in flight at about the 600 mile-point. The beam-switching test was organized by unmanned aircraft manufacturer General Atomics Aeronautical Systems and communications satellite operator Intelsat. It took place near the Grand Forks Air Force Base. A MQ-9 Reaper (also known as Predator B) switched between two spot beams on an Intelsat EpicNG high-throughout satellite. The Air Force did not request the test, but military and Defense Department officials were there to observe. “We’d been endeavoring for quite some time to get an opportunity to demonstrate the capability of the unmanned aircraft to switch between beams on one of the new Epic satellites,” Intelsat General Corp. President Skot Butler told SpaceNews. “We made sure it would fly far enough that it would have to switch beams multiple times,” Butler said. Intelsat and other satellite operators see unmanned aircraft as a critical target market for their new high-capacity spacecraft that push more data at faster speeds than the legacy wide beam kind. Vast amounts of bandwidth are available for live high-definition video streaming but the issue is how to get it into military UAVs that have older antennas and terminals. Satellite providers say all it takes are software upgrades but modifications of military equipment never are as simple as they seem. Satellite communications providers for some time have been trying to show the military the potential advantages of multiple spot beam satellite designs. Bigger and faster data pipes are one selling point. Another is enhanced security. Signals in spot beams are more difficult to jam and interference can be worked around more easily, Butler said. Whether it’s intentional jamming or accidental interference, he noted, the satellite’s digital payload can disconnect the uplink from the downlink and assign new frequencies and a new link to the UAV to reestablish the connection. All branches of the military own and operate different UAV models but they do not control the purchase of commercial satellite bandwidth, which is centrally managed by the Defense Information Systems Agency. Almost all Air Force unmanned planes are equipped with terminals that use commercial Ku-band. Transitioning to high-throughput Ku-band, Butler said, should be simpler and less costly than changing over to other commercial or military satellites that use Ka-band frequencies. There are modern multi-band terminals that can be installed in new aircraft but most of the military fleet has older hardware. 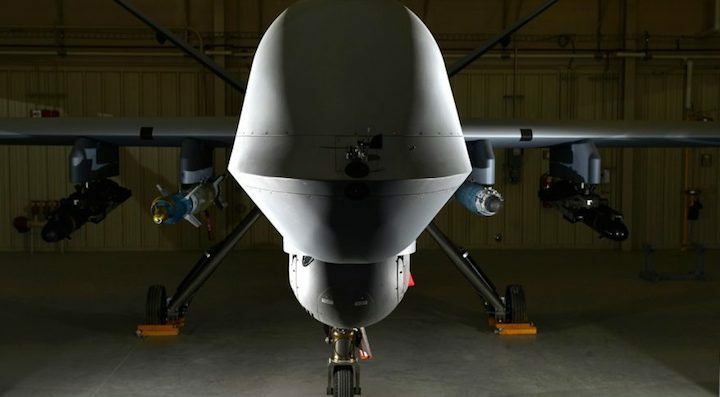 The Pentagon started to rush UAV production in 2001 to meet war commanders’ demands for 24/7 surveillance in Afghanistan, Iraq and other war zones. At the time the easiest way to get satellite capacity was through commercial Ku providers. The Pentagon back then did not foresee the UAV phenomenon would be permanent and 16 years later, the communications infrastructure has not changed much. Nicole Robinson, corporate vice president of SES Networks, said the company demonstrated that an Air Force MQ-9 Reaper drone that typically can pipe data at 5 to 10 megabits per second over commercial Ku band could increase the data rate to 30 megabits when connected to the company’s O3B satellite network. That system uses Ka band, as do Inmarsat’s high-capacity satellites. Rebecca Cowen-Hirsch, senior vice president of Inmarsat U.S. Government Business, has been pushing the case that the military should use commercial Ka band for manned and unmanned airborne missions. “A unique advantage of Ka-band over Ku-band is that it is the only frequency where the commercial and military bands are immediately adjacent to each other,” so commercial services can more seamlessly complement military satellite capacity. The U.S. government-owned Wideband Global SATCOM constellation uses the military Ka band.